The Central Precinct officer cops say mistakenly fired five shotgun rounds instead of beanbags at a man disobeying police orders Thursday was involved in a 2008 incident where a video camera recorded him aggressively rousting suspected drug dealers. The officer, Dane Reister, also ticketed the cameraman, though the Multnomah County district attorney's office declined to prosecute him. Reister and another officer had stopped two men next to the Portland Art Museum when Mike Tabor, who considered himself an independent journalist, began filming. The videotaping incident that netted Tabor a ticket unfolded when he spotted officers Dane Reister and Nicholas Ragona stopping two men on March 25 next to the Portland Art Museum. On the nine-minute video, one of the officers can be heard accusing one man of being a drug dealer and the other a drug buyer. The officer repeatedly asks one of the men for his ID and to allow himself to be patted down. At one point, the officer—identified by Tabor as Reister—tells the man to back away. And when the man takes a step back, Reister takes two or three steps forward and shoves the man in the chest. "That bugged me," said Tabor. "It really looked like intimidation—bully-type stuff." After patting the man down, the officers let both men go. Then Reister walks over to Tabor, asks him whether the camera was also recording sound, and when Tabor says yes, tells Tabor to hand over the camera. "I was just totally surprised," Tabor said. Tabor began to walk to Central Precinct to file a complaint. The officers pulled up in their patrol car and asked what he was doing and then said they would meet him in the lobby. Tabor claims that after he waited about 20 minutes, the officers returned his camera and handed him a ticket. After Thursday's shooting, Reister, a 15-year veteran of the bureau, was placed on leave, which is standard procedure when an officer is involved in a shooting. The suspect, who police say Reister hit with five pellets, was transported to a nearby hospital with non-life threatening wounds. As of this morning, police said detectives had yet to identify the man but described him in a news release as reportedly intoxicated and armed with a pocketknife. Mayor Sam Adams, Police Chief Michael Reese and Training Division Commander Robert Day are set to appear at a 12:30 press conference at the Justice Center to address the shooting. After Mike Tabor turned his video camera on two Portland cops rousting a couple of men on a downtown sidewalk, one cop seized his camera and gave him a ticket, saying he'd broken the law by recording the officers without their permission. The Multnomah County district attorney's office declined to prosecute, and now Tabor is trying to force the Portland Police Bureau to take a formal position on whether it's OK for civilians to videotape cops --with sound --in public places. In a tort claim notice to the city last week, attorney Benjamin Haile informed the city of Tabor's intent to sue for $100 and a written policy saying that citizens have the right to make video and audio records of police. Haile has taken on Tabor's case at no charge. He says recording officers on the job is a fundamental part of holding police accountable that Haile believes is protected by the First Amendment. The issue isn't an isolated one. Last month, Beaverton police arrested a 27-year-old Aloha man on accusations that he illegally recorded an officer arresting another man at a bowling alley. Ho Xent Vang recorded the encounter on his cell phone, and Beaverton police say the audio part of the recording violated state law because the officer didn't give his consent. In both cases, police were citing ORS 165.540, which makes it generally illegal to tape-record a conversation without first obtaining permission except in cases where a person wouldn't reasonably expect privacy, such as at a public meeting or sporting event. Portland police spokesman Sgt. Brian Schmautz said he believes the public doesn't have a right to record officers' conversations --on or off the job --without their consent. "Just because somebody is a police officer doesn't mean they give up their rights," Schmautz said. The videotaping incident that netted Tabor a ticket unfolded when he spotted Officers Dane Reister and Nicholas Ragona stopping two men on March 25 next to the Portland Art Museum. On the nine-minute video, one of the officers can be heard accusing one man of being a drug dealer and the other a drug buyer. The officer repeatedly asks one of the men for his ID and to allow himself to be patted down. At one point, the officer --identified by Tabor as Reister --tells the man to back away. And when the man takes a step back, Reister takes two or three steps forward and shoves the man in the chest. "That bugged me," said Tabor. "It really looked like intimidation --bully-type stuff." After patting the man down, the officers let both men go. Then Reister walks over to Tabor, asks him whether the camera was also recording sound, and when Tabor says yes, tells Tabor to hand over the camera. "I was just totally surprised," Tabor said. Tabor began to walk to Central Precinct to file a complaint. The officers pulled up in their patrol car and asked what he was doing and then said they would meet him in the lobby. Tabor claims that after he waited about 20 minutes, the officers returned his camera and handed him a ticket. Tabor said the officers told him he was standing too close and making them nervous in what could have been a dangerous situation. Tabor said he doesn't think he was standing too close --and if the officers thought he was, they should have said so. Deputy City Attorney Dave Woboril said he'll review the incident, but said that Oregon's law is "pretty complicated." Woboril said his reading of the statute is that people can't surreptitiously make an audio recording of others who think their conversations are private. But Woboril said most people assume that someone holding a video camera out in the open is recording sound as well as video. In general, he believes civilians have the right to record officers in public places in that way. In 1991, then-Police Chief Tom Potter issued a training bulletin stating that the public had the right to record video and audio of police arresting suspects in a public place. Woboril, Schmautz and Police Chief Rosie Sizer weren't aware of the bulletin, but Tabor's attorney, Haile, dug up it up in his research. Haile said he wants the bureau to specify that police stops --not just arrests --can be recorded. He also wants the policy put in the bureau's policy and procedures manual, so it won't be forgotten. Haile noted that Potter's bulletin was issued shortly after a bystander videotaped the beating of Rodney King, a black man who was stopped for speeding, by four Los Angeles police officers. The videotape spurred widespread discussion about police brutality. Dan Handelman, of Portland Copwatch, said he hears about a few cases each year in which video cameras are seized by police. He says if police are acting professionally and lawfully, they should have no objection to being videotaped. "It could end up exonerating the police --it could be good for them." Portland police officers don't have the right to seize video cameras and cite people for recording them in public in all but the rarest of circumstances, according to the Portland city attorney's office. Mike Tabor, who considers himself an independent journalist, tangled with police last March outside the Portland Art Museum, when he videotaped two officers rousting a pair of suspected drug dealers. One of the officers seized his camera and gave him a ticket, citing the state's eavesdropping law, ORS 165.540. The Multnomah County district attorney's office declined to prosecute. Deputy City Attorney David Woboril conceded in a letter to Tabor on Wednesday that Oregon's law on recording police is confusing and that officers have had difficulty interpreting it. Woboril said that under state law, all someone has to do to lawfully record is to inform officers --and holding a video camera or a cell phone in plain sight is enough to do that. "Oregon law and the Portland Police Bureau recognize that recording has come to be expected in our public lives --a fact that even the microphone-shy must accept," Woboril wrote. Woboril said one of the only times such a recording would be illegal is if the officers requested privacy and then someone secretly recorded them using a hidden device. In September, attorney Benjamin Haile informed the city of Tabor's intent to sue for $100 and a written policy saying that citizens have the right to make video and audio records of police. Haile took on the case at no cost, saying he believed that recording officers doing their jobs in public is fundamental to holding police accountable and is protected by the First Amendment. Haile and Tabor were pleased with the city's response Wednesday. "All and all, I feel good," said Tabor, who frequently posts videotapes of police stops on his Web site joe-anybody.com. "We can film the police, and they don't have to treat us as criminals." Tabor figured the cop who seized his camera was annoyed at being videotaped because he may have been pushing the bounds of good police work. Woboril said the Police Bureau didn't plan to write clarifications about the law into policy --as requested --but it did plan to clarify the law in training bulletins and possibly the bureau's manuals of standard operating procedures. Woboril also said officers would receive a refresher about the law as they cycle through their upcoming in-service training sessions. Haile is pushing for the clarification to be written into the bureau's manuals of standard operating procedures because he doesn't want it to fade again from institutional memory. In 1991, then-Police Chief Tom Potter issued a training bulletin referring to the public's right to record police, but Chief Rosie Sizer and the bureau's public information officer weren't aware of it when Haile filed the tort claim notice. "A lot of police officers think it's illegal to record them with audio, and I think this should clear that up," Haile said. It looks like the ability and the “right to film” the police is being honored in Portland. The City Attorney just passed along his agreement that there is a new policy change that will be clear that you can film the police while they are on public duty. It was a surprise for me that they were agreeing and the policy looks good . From the very beginning I never thought what I was doing should or would be illegal. Filming the police is and should be a community service that everybody benefits from. It provides an insight into the going-on’s of the community at large and the actions and interactions of the police with their community they are serving. While out on the streets or even on private property (with property owners permission) filming all that is happening is perfectly OK & legal to do. It seems that this new change will be in the current trainings and will be explained to the force. I am somewhat concerned as I mentioned that this could get forgotten over the years. If so it would be an error of the Portland city police and they would most likely be held fully accountable. Is a person who practises journalism, the gathering and dissemination of information about current events, trends, issues and people. Reporters are one type of journalist. They create reports as a profession for broadcast or publication in mass media such as newspapers, television, radio, magazines, documentary film, and the Internet. Reporters find sources for their work, their reports can be either spoken or written, and they are often expected to report in the most objective and unbiased way to serve the public good. A columnist is a journalist who writes pieces that appear regularly in newspapers or magazines. Depending on the context, the term journalist also includes various types of editors and visual journalists, such as photographers, graphic artists, and page designers. Journalists put the information in their own words, making it creative in their own way so it will catch the reader or viewers attention. In 1991, after the world watched the videotaped beating by Los Angeles cops of Rodney King, Portland Police Chief Tom Potter sent a training bulletin to his troops. Welcome, he said, to your new world. Now get used to it. Potter's message: Citizens had every right to record police officers making arrests in a public place. Sadly, some members of the Portland Police Bureau still don't get it. Early this year, Mike Tabor turned his lens on two Portland cops who were rousting a couple of men on a downtown sidewalk. One of the officers confiscated Tabor's camera and ticketed him for breaking the law by recording them without their permission. Wisely, the district attorney declined to prosecute. But Tabor isn't done. He's now urging the Portland Police Bureau to adopt a written policy stating that citizens have the right to make video -- and audio -- records of police actions. Portland cops aren't alone in this conflict. Beaverton police recently arrested an Aloha man on accusations that he illegally recorded an arrest using his cell phone. They claimed the audio part of that recording violated state law. There is indeed a law -- ORS 165.540 -- making it generally illegal to tape-record a conversation without first obtaining permission. But Portland Police Chief Rosie Sizer recognizes that it's no longer possible for either the law or her bureau's policies to separate video from audio recording. After all, half the people in Portland, it sometimes seems, already carry a cell phone that does both. "Technology," says Sizer "seems to have outstripped the law. Rather than pursue a piecemeal city-by-city, or county-by-county approach, the Legislature should take care of it." As for Tabor, he's now pushing beyond trying to establish a right for citizens to record arrests on the street or in a public place. He's calling for a city policy embracing the right of people to record police actions on private property. In your front yard, say. Or your living room. There may indeed soon be a recording device in your living room. But it won't be your cell phone. It will be the video camera being worn by the cop who just came through your front door. "People need to remember," cautions Sizer, "that this changing technological window works both ways. The bigger issue for folks may be the emerging lack of privacy." The chief has been tracking the number of American cities that have gone far beyond what Portland has done in installing cameras in public places. "There's little indication that they inhibit the commission of crimes," says Sizer, "but they can be a tremendous asset in solving crimes. A camera doesn't always deter the stupid act, but it increases the likelihood we can apprehend the bad actor." And as for that fast-emerging technology enabling officers to wear cameras for evidentiary purposes, "That's the flip side of this discussion," says Sizer. "Us watching you as well as you are watching us." Seventeen years ago, a video of the arrest of a Los Angeles resident named Rodney King raised questions about recording police officers. Many of these legal and ethical questions still resonate in Oregon and elsewhere today. A Portlander who recently had his camera confiscated and received a citation for taping cops in action, intends to sue the Portland Police. The Oregon law used by officers to confiscate observers’ equipment is somewhat ambiguous. It’s unclear how the law applies differently to video than it does to audio recordings. For now, police observers continue to use video as a tool, and police officers continue to decide how to address the practice one case at a time. The city of Beaverton, for example, just decided not to pursue charges against a man who was arrested for recording another arrest. What are the benefits and drawbacks of recording audio and video of police officers? Have you ever observed an arrest or other police action? What did you see? If you’ve ever been stopped or arrested by police, how did you feel about being observed by your fellow citizens? An update on the situation where ( i ) an independent media videographer (and average joe citizen) who filmed the police in downtown Portland, had his camera confiscated and was issued a ticket. The ticket based on ORS 165.540 was for illegally recording a conversation without consent. It was weeks later at court that I was told: "The charges were not being pursued by the DA at this time." They said I should "check back-in, in a couple weeks"
I did and they were not pursuing it. The fact of "no charges" is great, of course. Only now, I have to worry for two years that they "might change their minds." Let me explain a couple things that were interesting about what happened that day. All I did was film two police officers (latter it became three) on a public sidewalk from a safe distance away. I never disturbed nor acted threatening to that police situation that I was filming. As an independent video / film documenter for peace and justice events that happen here in Portland, I felt I was acting perfectly within my rights to video tape this public happening. As recieved or noticed I will post links to this subject in order of being recieved right here on this page and this location on the page. Mike Tabor on March 25, 2008 at SW 10th and Main. Mike Tabor hereby gives notice that he has a tort claim against the City of Portland and Officers Nick Ragona, DPSST#21430 and Dane Reister, DPSST#31663. On March 25, 2008 Mr. Tabor witnessed the officers stopping two men on the sidewalk of SW 10th Avenue beside the art museum. Mr. Tabor began recording the encounter with his video camera. The two men were stopped, searched and released by the officers. Mr. Tabor remained at a reasonable distance from the officers during the stop. After the stop was over, Mr. Tabor was questioned by the officers and asked if he was recording audio. He replied that he was. Officer Reister then demanded that Mr. Tabor hand over the camera, which he did, and Officer Reister wrote Mr. Tabor a property receipt for the camera. After the officers took his camera, Mr. Tabor began walking toward the police station at 1111 SW 2nd Avenue. The officers approached him again in their patrol car at or near SW 4th and Main streets. Mr. Tabor informed them that he was going to file a complaint. Officer Ragona then suggested that he meet them at the station. Mr. Tabor proceeded to the station and waited for about 20 minutes, after which the officers returned his camera to him and served him with a citation for â€œObtaining Contents of Communication (Unlawful),â€� an alleged violation of ORS 165.540, a class A misdemeanor. At that time, Officer Ragona informed Mr. Tabor that the men they had pursued were drug dealers. The officer also told Mr. Tabor that he had been standing too close and made the officer uncomfortable. This information is reflected in Officer Reisterâ€™s report. However, no officer gave any of the observers any indication that they were too close during the encounter. Mr. Tabor appeared in court on April 22, 2008 as required by the citation. He was informed by a deputy district attorney that the district attorneyâ€™s office had decided not to file a complaint. Mr. Taborâ€™s damages include the emotional distress and inconvenience from having his camera taken, retrieving it from the police station, believing he was being prosecuted for a crime, and appearing in court. Mr. Tabor suffered emotional distress from the violation of his First Amendment right to freedom of speech. Mr. Tabor frequently makes videos that he posts on his own website and on other public websites. Confiscating his camera and charging him with a crime was distressing for Mr. Tabor because he values his right to freedom of speech very highly. Mr. Tabor is asking for only nominal compensation for his damages, in the amount of $100 plus reasonable attorney fees. 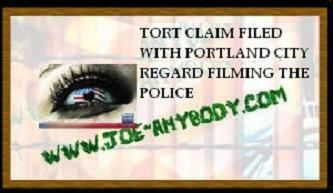 Mr. Tabor is pursuing this claim because he wants to make sure that the City of Portland and the Portland Police Bureau establish a clear policy against seizing video cameras and/or prosecuting people under ORS 165.540 solely because they record public police activity including stops and arrests. He believes that this is a serious and all-too-common practice by some officers in the Portland Police Bureau. Sanctioning people under ORS 165.540 for recording stops and arrests is a violation of the First Amendment because it prevents people from recording a matter of public concern and communicating that information to others. A person who witnesses a stop or arrest will be far less able to express what they have seen and heard to others if they are deprived of the option to make a video recording and show the events to others. The defendant concedes that the Oregon Court of Appeals affirmed a conviction under ORS 165.540 for recording a conversation with police officers in State v. Bischell, 101 Or.App. 257, 261 (1989). There, Eugene police officers stopped the defendant while she was recording police radio transmissions. A tape recorder was in her backpack when she was stopped. She did not turn off the recorder or inform the officers that it was recording during the stop. The court held that there was evidence sufficient to prove that she knowingly recorded the conversation that transpired during the stop without the consent of the officers, in violation of the statute. Bischell does not resolve the present case for three reasons. First, extending the statute to prohibit video recordings that include audio would have a vastly greater impact on freedom of expression. Video recordings of stops and arrests are one of the publicâ€™s most effective tools for monitoring and publicizing matters of public concern involving police. All video recording devices include audio recording devices. Even if an individual managed to turn off the audio recording device, police would have probable cause to believe that the audio was recording, which would give them authority to seize the camera and prevent further video recording. Second, prohibiting video recordings which include audio would serve a much smaller privacy interest than prohibiting audio recordings alone, since a video recorder has to be operated in public view. Using a hidden camera as a secret audio recording device would not qualify as making a video recording, and would be prohibited. Third, in Bischell the Court did not discuss the constitutionality of the statute. As applied to the recording of stops and arrests by police, Mr. Tabor argues that ORS 165.540 is unconstitutional because these audio and video recordings are protected by the First Amendment. In 1991 Tom Potter, as chief of police, in cooperation with the city attorneyâ€™s office, apparently interpreted ORS 165.540 to permit the public to record police activities in a public place. Perhaps this was an effort to avoid application of the statute that would infringe on First Amendment protections. Please see the attached letter from Mr. Potter to the president of the Portland Chapter of the National Lawyers Guild, dated September 12, 1991, and the accompanying copy of a training bulletin from the city attorney. These indicate that arrests on a public street are events which are excepted from the application of the statute. Mr. Tabor did not record an arrest. Therefore, the training bulletin does not explicitly address the facts presented. However, there is no reason to believe that a stop is less public or less an event than an arrest. Indeed, many arrests are preceded by a stop, and it would be pointless to allow members of the public to record only the arrest, and not the events which lead up to it. The 1991 policy bulletin also includes only arrests â€œon the street or in a public placeâ€� within the scope of events which can be recorded. The event that Mr. Tabor recorded occurred in a public place. However, he asks that a full clarification of the cityâ€™s policy include an indication that ORS 165.540 does not prohibit recording stops and arrests on private property. If the reasoning of the 1991 policy bulletin is to be retained, stops and arrests on private property should be considered events. The person making a recording on private property would, of course, have to comply with all appropriate laws, including laws against trespassing. Mr. Tabor respects the concern that police officers have for their safety and the safety of others. He does not allege that the First Amendment provides any protection for people who move too close to a police officer or in any other manner interfere with a stop or arrest. He asks only that the city policy be clarified so that people who make recordings of police activities including stops and arrests are not punished under ORS 165.540. It appears that a policy bulletin is not an effective way to protect the people from sanction under ORS 165.540 over a long period of time. Accordingly, Mr. Tabor asks that the appropriate policy revision be included in the Portland Police Bureau Manual of Policy and Procedure. Please contact me to discuss this matter. Mr. Tabor has no desire to engage in litigation with the City of Portland. However, he is very concerned that the city address the ongoing problem of Portland Police officers seizing cameras and charging people for recording the activity of the police officers. He will resort to filing a federal claim under 42 USC 1983 for violation of his First and Fourth Amendment rights, and a state law claim for conversion of property, if the city is unwilling to address this problem. The report tries to paint a much different story, than you see in my un-edited video. 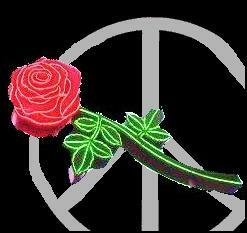 And even more so is the expectation that the police will treat citizens with respect and not with intimidationa and threats of loss of liberty and freedom, by imposing fines and jail sentences. Can you count the number of violations of civil rights you see in this? "Little Brother Watching Big Brother"